S’mores Fudge is everything you love about a classic s’more but in a smooth, creamy chocolate fudge with swirls of sweet marshmallow and crunchy graham cracker crumbs. As you may know Saturday was National S’mores Day – I love how everything seems to have a holiday now. I went with a deconstructed s’more because I was feeling lazy and my lack of effort left me craving more. Yesterday I was craving fudge, I try to be good and only eat it at Christmas-time, since I lack all control when I am around it. One of the best things about my brother-in-law coming home for the holidays is that he loves fudge too, so my mother-in-law always makes a lot of it. So I started pulling all of the ingredients together to make myself some fudge and thought why not make it s’mores fudge and kill two cravings at once. The result is everything you love about s’mores but in a smooth, creamy fudge. With sweet marshmallow swirls and crunchy graham cracker crumbs, I know you’ll love this recipe too, enjoy! Line a 5″x7″ pan with aluminum foil, crumble one sheet of graham cracker over the bottom of the pan and set aside. In a saucepan over medium heat cook the butter, sugar and milk until boiling. Boil the mixture for 4 minutes and remove from heat, stir in the chocolate and marshmallow creme until melted and smooth. Spread the fudge into the pan and using a knife swirl in the remaining 1 oz. of marshmallow creme. Crumble the remaining 1/2 sheet of graham cracker over the top of the fudge and press lightly to adhere. Cover with plastic wrap and refrigerate for 2-3 hours until firm, slice and serve. Oh yum, this looks divine! PINNED. Oh it is, I may have eaten some for breakfast! Those look amazing! Will have to try this one for sure! Thanks for sharing with us this week! I wish you all were close enough to share with, my waistline does too! Emily, I’ll take two batches please! 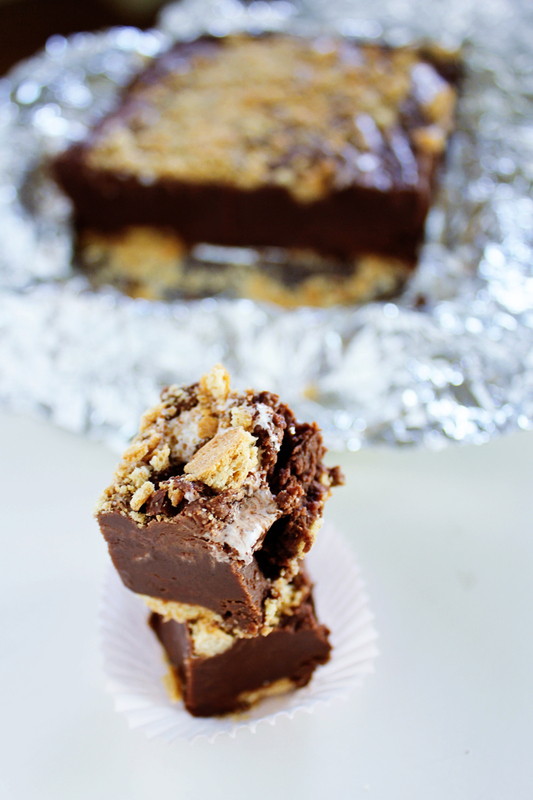 Love the idea of s’mores fudge!! You can just tell how smooth and creamy that one bite is, oh I wish that was my bite! Oh yea- that will do it for me! You should definitely make yourself a batch! Yay for a fun summer fudge!!! This is super incredible looking!!! Being pinned!!! I can’t wait for it to cool off a bit more so I can make some of this, double yum! Pinned! I love anything s’mores and these look amazing! Thanks for linking up! I love the name of your blog! This fudge sounds divine. Looks delicious, could I use an 8×8 pan instead?